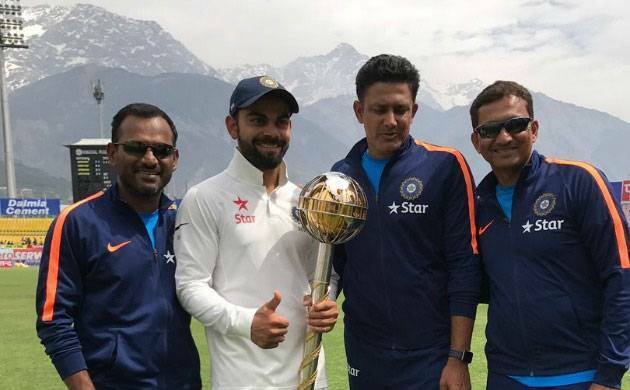 India’s emphatic performance in Border-Gavaskar Trophy helped them retain the ICC Test Championship mace. They also received USD one million in cash for holding to the top position in the Test Team rankings on the annual April 1 cut-off date. “We are absolutely delighted to have topped the ICC Test rankings. The longest format of the game really tests a team’s character and I’m proud that we have proved ourselves to be the best,” Kohli said. “Being presented with the Test championship mace last year was an exhilarating experience and the feeling is no different this time. “I’d like to both congratulate and thank everyone who has been part of this success. This includes not only all the players who have been in the squad but also the team management and support staff, without whom we could not have done so well. It has not been an easy journey but all the hard work has been worth it. “The horizon has changed with the development of the limited overs formats but Test cricket has held on to its own even 140 years after it was first played. ICC Chief Executive David Richardson: “On behalf of the ICC, I would like to congratulate India for achieving and maintaining number-one status amid some stiff competition, particularly from Australia and Pakistan who both held the top spot over the last year, and South Africa who have had some great Test series wins of late. “The team has shown great consistency over the last 12 months, it possesses a variety of talent and is an exciting team to watch.